If you want to trigger something only when Lara is at a particular height above a sector you can use a vertical trigger. To find the vertical triggers, change the "TYPE (Activation mode)" dropdown box of the Set Trigger Type window in NGLE to CONDITION and scroll through the list. This list is in alphabetical order so you'll find them near the end. Note the "Trigger (what to trigger)" dropdown box may change to PARAMETER since vertical triggers cannot be applied to anything else. 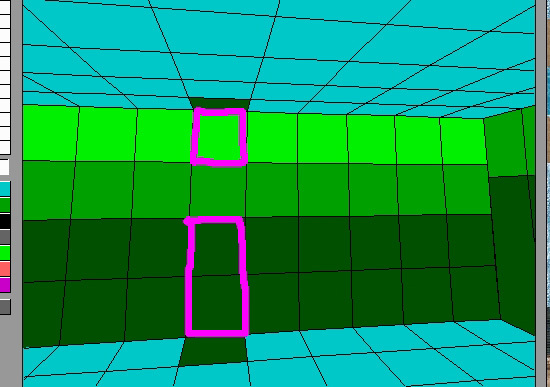 There are three types but in each case you have to specify a height above the floor in clicks where the zone starts and how many clicks the zone extends above this height. Can use steps of 0.5 clicks. I have created a climbing surface in a 16 click high room. The wall panels are each 1 sector (4 clicks) tall. 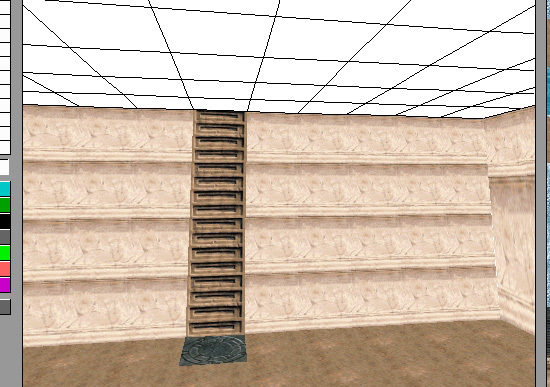 I want to trigger an event when Lara is in the section of the climb shown below. Using the wall panels as a guide, I want to trigger the event when Lara's height above the floor is between 8 clicks and 12 clicks. That is, I want a zone that starts 8 clicks above the floor and is 12 - 8 = 4 clicks tall. 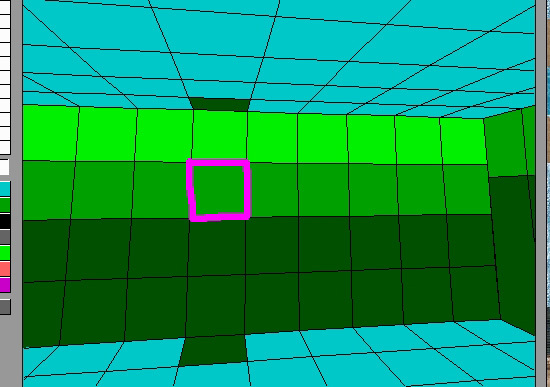 In NGLE I create the vertical trigger and place it on the sector with the climb. Select the height at which the zone starts in the "Object to Trigger <#>" dropdown box and select how tall the zone is in the "(E)xtra" dropdown box. On the same sector with the vertical trigger, I place the trigger for the event I want to happen. In this case I will use a FLIPEFFECT trigger to have Lara die in flames. Note that the vertical trigger does not require the climbing surface. The climbing surface is only there to get Lara to the height. If I use DOZY to fly Lara into the zone she will be set on fire. 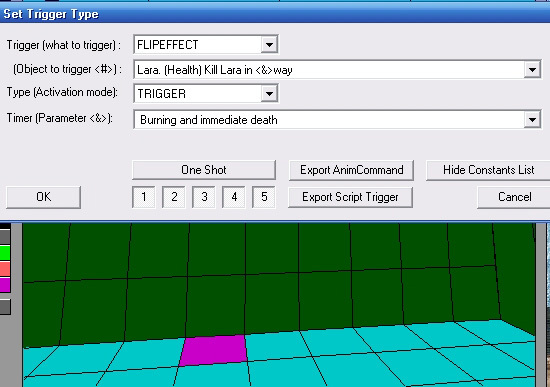 If I change the type of vertical trigger to "Vertical Trigger: Inverse zone of <#> clicks from floor and high (E) clicks" in the "Timer (Parameter <&>)" dropdown box and leave the other settings the same, the vertical trigger zone (where Lara dies in this example) will be the first, second and fourth parts of the ladder instead of the third.